A convenient, water-resistant aerosol bandage that creates a protective barrier against external irritants in simple wounds of small and large animals. It is ideal for application to minor cuts and abrasions. Leaves no antibiotic residues. Fast and easy to use spray application. Provides a protective barrier while still allowing the wound to breathe. 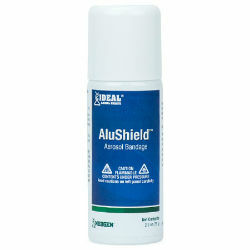 May be applied over ointments or salves helping reduce the risk of infection. Can be easily removed with soap and water. Contents under pressure. Do not use in the presence of an open flame or spark. This product stains. Avoid contact with hands, clothes, and objects. For external use only. Not intended for use in deep, infected, open/draining or complex wounds. If in doubt, please consult a veterinarian.